It’s officially December and if you haven’t winterized your home yet, don’t worry, we got you covered. Here in Canada we are blessed with having very unpredictable winters. It seems to go from one extreme to the other each and every year. One year there’s only enough snow to go tobogganing 2 days in the whole season and the next year you’re digging your way out of a 5 foot tall snow drift in the morning to get to work. #1 and I mean THE MOST IMPORTANT thing to do right now, is get your furnace inspected, right now! Walk away from the computer, pick up the phone and call your heating and cooling company now! Have you ever had your furnace die on the coldest day of the year? No? Well I have… twice and it was a nightmare and I would do anything to prevent it. Nothing like being able to see your own breath inside your home and having to take over your parents house with your 4 kids for a week while the furnace company tries to fix the problem. I won’t make that same mistake…. thrice. 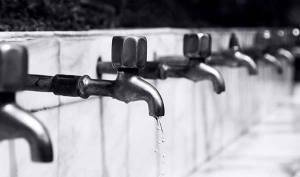 #2 Our second most important winterizing tip is to shut off your outside taps. This reduces your chances of having a burst pipe, an almost equally unenjoyable experience. One that I have not yet experienced in my 11 years of home ownership but I’ve heard tale of the aftermath and it is no fun! #3 Check caulking and weather stripping. When it comes to keeping your house toasty warm and your heating bill down a little thing can go a long way. Slide your hand around the perimeter of your windows and doors to check for cracks in your caulking and drafts. You can re-caulk or replace weather stripping quickly and cheaply and it makes a biiiiiig difference. #4 Check to make sure that none of your vents are being covered by furniture. 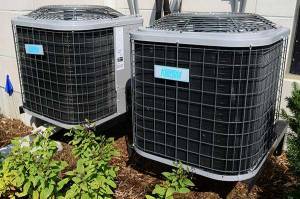 I was a culprit of covering my vents with big furniture like couches or recliners but if you want to keep that warm air flowing freely through the house you want to make sure that there is nothing obstructing those vents. #5 Cover your air conditioner. Let’s be honest, air conditioners ain’t cheap and a super easy way to protect it from rust or damage caused by extreme weather conditions is to cover it up for the winter with a sturdy vinyl cover to keep it in good shape and ready to go when the temperature begins to rise again. There’s a plethora of other things you can do to help chase away Jack Frost but if you’re keeping it basic and easy make sure to take a few minutes to follow these steps and you’re on your way to a comfier, cozier, Canadian winter. From all of us at the Munir Group, stay warm, stay safe and enjoy your holiday season.